Doesn't that look good? Well I have to say it was pretty good, I made it last weekend when the sun was blazing hot, not like this weekend when soup was on the menu! It was warmer today, but still not really salad weather. 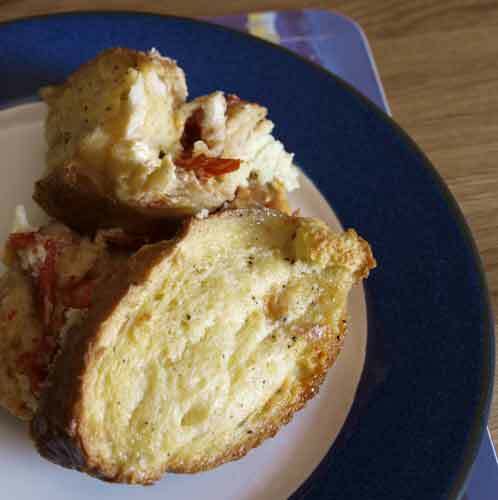 This is another lovely recipe from the Slimming World magazine I bought and with recipes like these, I am not finding it too difficult to resist temptations! 1. Heat a frying pan sprayed with Fry light. Add the king prawns and stir-fry for 2 minutes. Add the garlic and tomatoes and cook for a further 2 minutes. Remove the pan from the heat, drizzle over the lime juice and set aside to cool for 5 minutes. 2. Divide the rocket, spinach and watercress salad between four serving plates. Arrange the chopped mango and cucumber on top. Divide the prawn mixture between the plates, pour over any remaining pan juices and serve straight away. It's about 9C here today and raining! I was feeling pretty cold and had about 40 minutes before lunch was due, so thought I'd see what was in the fridge that I could make into soup! Hmmm, some rather dodgy potatoes, wrinkly and starting to sprout, it's so difficult to keep potatoes at this time of year, onions, carrots and a courgette. 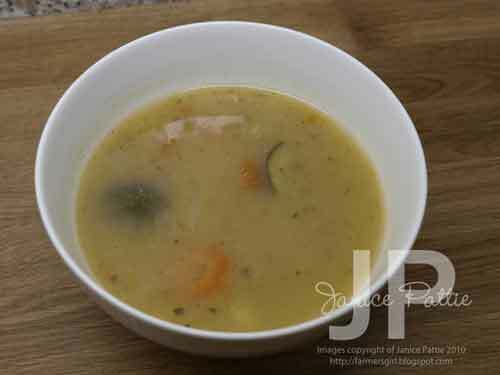 Yes, that was enough to make some soup and it would be low cal too. 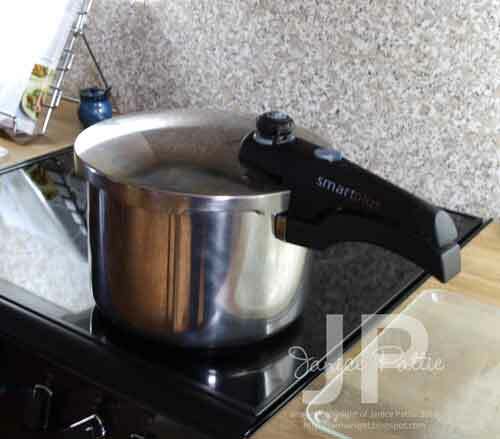 ...my beloved pressure cooker! This is the first time I've used it on my ceramic hob, it takes a little longer to get up to pressure, but there is a more even temperature to maintain the pressure cooking. Once it is up to temp, it's only 10 minutes till you have your lovely pot of soup. 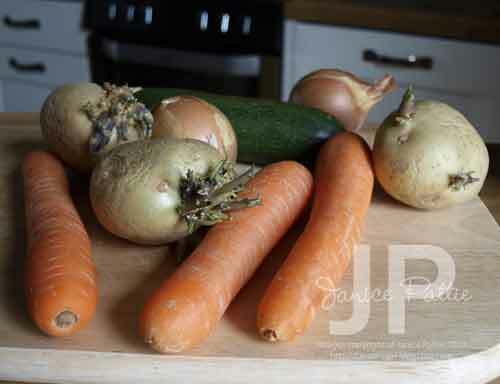 I took out some of the veg, then liquidised the rest of the veg and stock with a hand blender and put back in the lovely chunky bits that I had saved. It was lovely and warming especially with a generous grinding of black pepper. I'm on a mission to lose a few pounds and now that the kitchen re-fit and wedding are past I don't have any more excuses! So I bought a copy of Slimming World Magazine as it was full a rather tasty looking low fat food. It is a fairly simple recipe 'one tray' gives it away don't you think? 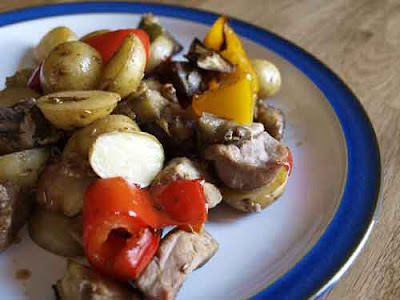 However, I have made a few adjustments as the potatoes weren't quite cooked and I had to cook it all longer so that the meat got a bit dry and hard. However that is probably me as the recipe did say to slice thinly, somehow I feel that those little new potatoes should not be sliced too thin but be in nice chunks, so if you want to do the chunky potatoes either par boil them for a few minutes before roasting or put them in the tray first and cook for 10 minutes before starting to add the other ingredients! 1. Preheat your ovento 220C/425F/Gas7. Place the potatoes in a roasting tray along with the peppers, aubergine, courgettes, onions, rosemary bay leaves, smoked paprika and garlic. Add the oil, shake to coat the vegetables and season to taste. 2. Roast in the oven for 10 minutes. Shake the tray and add the pork pieces. Cook for a further 10 mintues. Turn down the oven to 180C/350F/Gas4 and cook for another 20 minutes, shaking occasionally. 3. Discard the bay leaves. Squeeze the garlic out of the halved bulbs, mix with the meat and vegtables, divide between four bowls and serve. 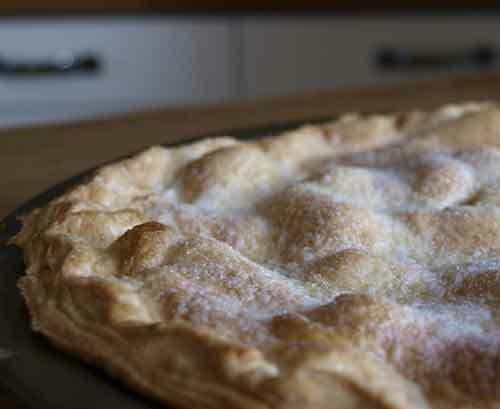 I made a Rhubarb tart tonight. I haven't done anything with the rhubarb since I made the Muffins, things have been a bit hectic, what with my son's wedding and I have not felt much like cooking, let alone blogging. 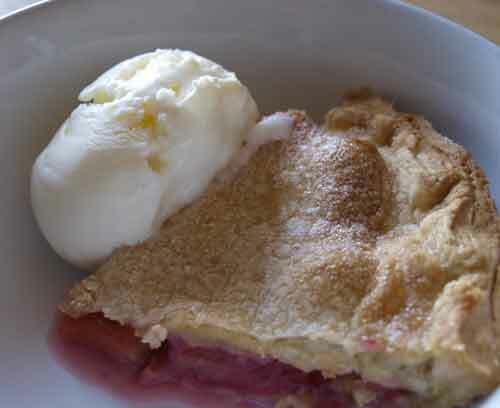 There isn't really a recipe, I cheated and used Jus-Rol All Butter Shortcrust pastry, mixed the chopped rhubarb with a tablespoon of cornflour & 2 tbsp caster sugar and baked it till the pastry was golden. 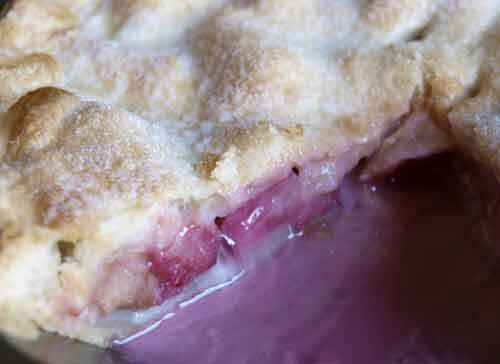 The cornflour helps to soak up with juices from the rhubarb, so the bottom of the pie doesn't get too soggy. I served the tart 'a la mode' with a scoop of vanilla icecream. My elder son got married yesterday. I didn't make the wedding cake, but as this is a food blog, I thought I'd share a photograph of this very simply but effectively decorated cake. 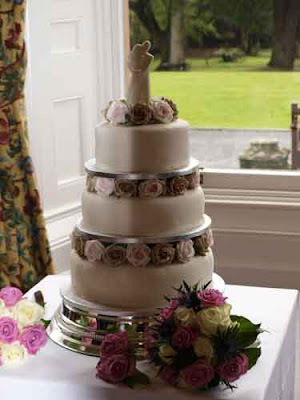 The cake itself was delicious (I had the fruit cake layer) and was made by one of the bride's aunts. There are more photos of the wedding over on Serial Crafter. I bought some cherry tomatoes yesterday and when I got home I realised I hadn't used many from last week. There they were sitting in the bowl, mostly very ripe with the odd one that had to go in the compost. I thought I had better use them before more got past their best and had to go out. I had also bought a 'baton' loaf in Tescos last night for only 7p, reduced at the end of the day, it had already gone a bit soft by this morning so also needed using up. 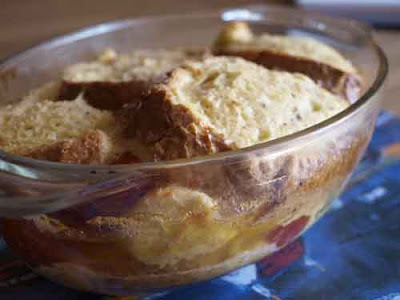 Plenty of eggs in the basket, so I thought I'd make a sort of Bread & Butter pudding with roasted tomatoes. First roast your tomatoes, I put them on a non-stick baking tray with 1 tbsp olive oil and roasted for 15 minutes at 200C. Meanwhile, butter your baking dish, small and deep rather than large and shallow, and beat together the three eggs, milk, salt & pepper. Dip the bread slices in the egg mixture making sure that they are well soaked in egg, put a layer of the bread in the bottom of the dish. Take the tomatoes out of the oven and put on top of the eggy bread, then put another layer of egg soaked bread over them. Dot with butter and bake until golden brown, about 20 minutes at 160C. 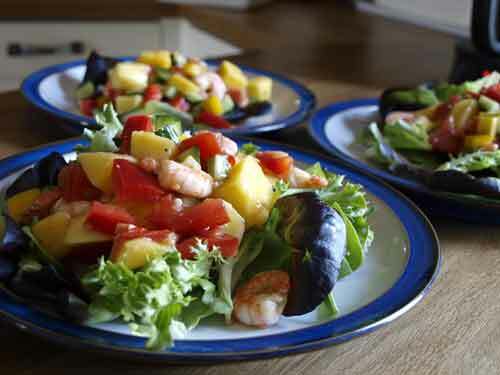 Serve on it's own as a lunch or breakfast dish or with salad or vegetables as a main course. 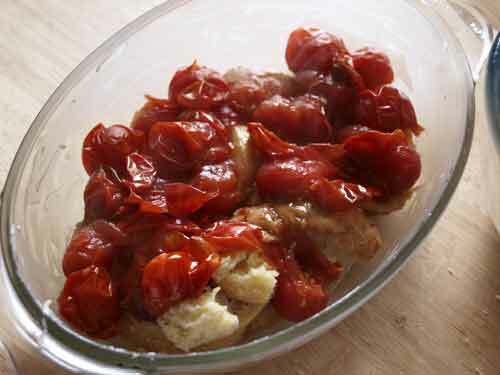 The roasted tomatoes on top of the first layer of eggy bread. 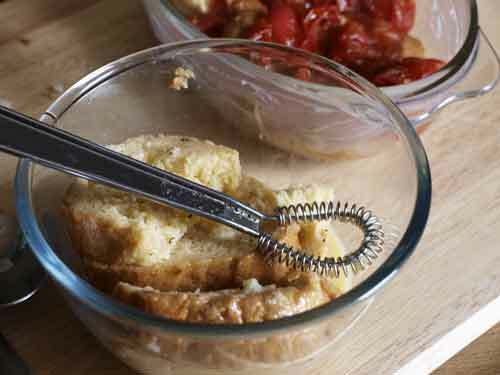 I have to say that this was really delicious, the sweetness of the roasted tomatoes complemented the eggs and bread, I would definitely make it again. 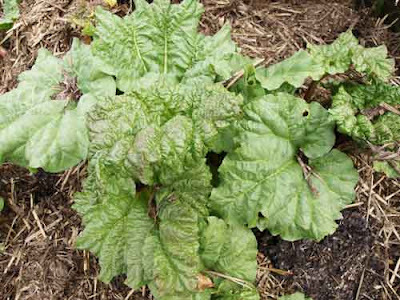 We have rhubarb in our garden. It got a big pile of manure put on it when it was still dormant, so it is only just starting to push through now and there isn't very much yet. 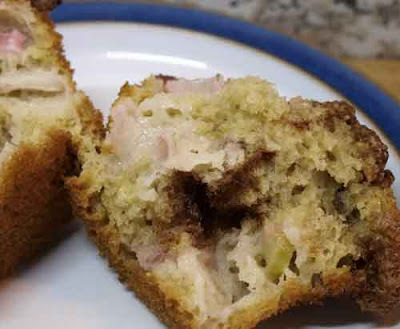 I didn't want to make a crumble (my usual stand by) so I had a look to see what else I could do with a small amount of rhubarb and came up with a recipe for muffins. The recipe comes, not from the Internet for a change, but from a book I've had for a few years but have probably only used a couple of times, 500 Best Muffin Recipes by Esther Brody. This is the lovely gloop that happens when you mix the wet ingredients together with the rhubarb and pecan nuts. 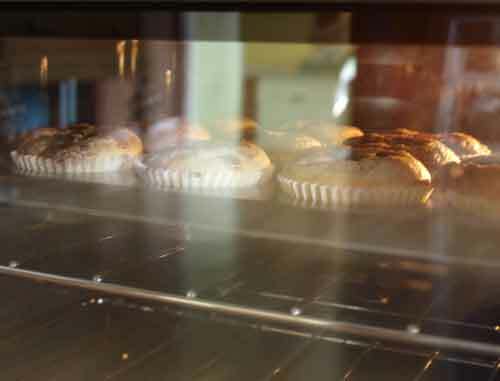 Can you tell how excited I was to be able to SEE my muffins rising in my new oven - lol! 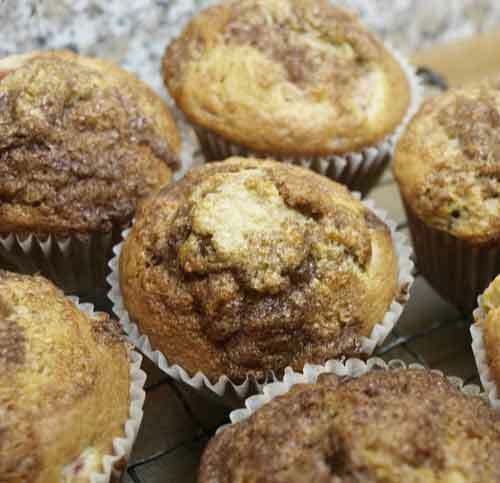 What really makes these muffins so delicious, is the cinnamon, sugar and butter topping, it is divine. 1. In a bowl whisk together brown sugar, oil, eggs and vanilla; mix well. 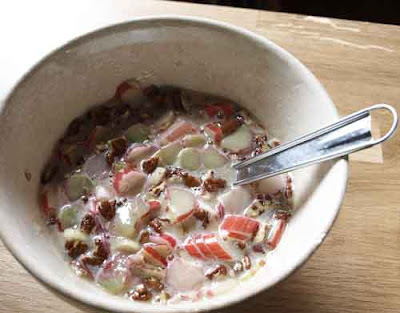 Add buttermilk, rhubarb and walnuts or pecans. 2. In another bowl combine flour, baking powder, baking soda and salt. 3. In another bowl combine sugar, cinnamon and butter. 4. 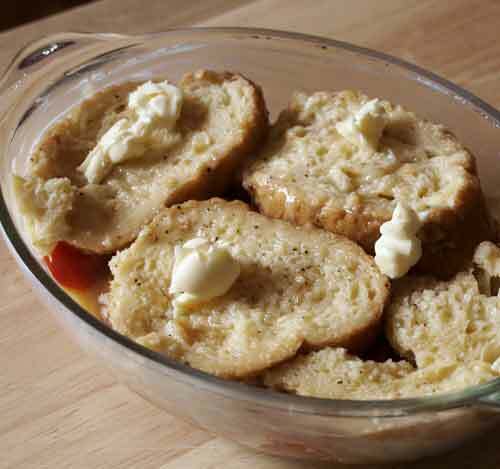 Spoon batter into prepared muffin tin, filling three-quarters full. Sprinkle with topping. Bake in preheated oven for about 20 minutes. These are some of the best muffins I have made, they have a lovely crunchy top and the combination of rhubarb and pecans through the muffins makes them both moist and delicious.